At first thought, purchasing a foreclosed home can seem like a cost-effective way to buy a house. The chance to become a homeowner with less money invested is ideal and certainly possible under the best circumstances. But, there are huge trade-offs in securing a foreclosed home. The first and biggest trade-off is that at the end of the day, your bargain might not be a bargain at all! From appraisal and inspector fees to home improvement costs, there is no guarantee your foreclosed property will be a good buy. These monetary estimates don’t take into account the weeks, months, and possibly years it could take for the entire buying and closing process to cycle through--not to mention the elevated stress levels from the uncertainty of trying to work with multiple red tape laden institutions. But...there are valuable real estate opportunities out there if you have the patience. As of February 2019, RealtyTrac reported that the foreclosure rate in the U.S. is 1 in every 2,471 homes, which translates to 434,172 properties in U.S. that are in some stage of foreclosure. Of the top five states with the most homes in distress, it's interesting to note that two have significant military populations, Maryland and Florida. Although it's disheartening to consider that military families are struggling to pay their mortgages, these statistics show that an inventory of foreclosed homes does exist where other military buyers live, work, and could potentially purchase a home at an attractive price. For reference, RealtyTrac estimated that in March 2017, foreclosed properties sold at close to a 37% discount. If there ever was a time to work with an experienced and specialized real estate broker and lender, it's during the process of buying a foreclosed home. This is especially true if you hope to make the purchase with your VA loan benefit. It's also a good idea to seek recommendations for a real estate attorney who knows foreclosure laws backward and forward. But first, find out if you're financially prepared to buy a home. What to Know About Your Finances Before Buying a Home answers many popular questions buyers have. A foreclosed home wasn’t always a foreclosed home. The process to get to that designation includes three possibilities: short sale, pre-foreclosure, and finally, foreclosure. Each has a difference that is important for buyers to be aware of, because they can affect the final sale. 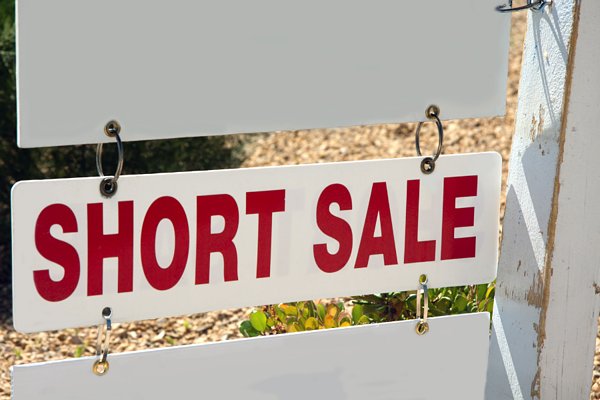 There are two conditions on which a homeowner can request a "short sale." If the owner owes more on their mortgage than what their local market values, and if the owner is extremely delinquent and likely not able to fulfill their loan agreement, they may ask the bank to accept a payment that is less than is owned on the mortgage. Why would the bank agree to a short sale? 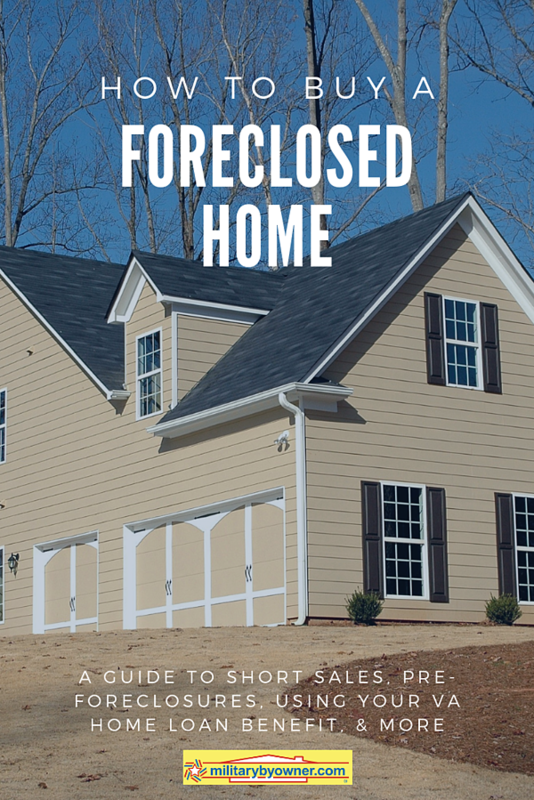 Because the bank loses even more money if the home moves into the foreclosing process. A short sale is also better for the seller’s credit report. A short sale may or may not be in pre-foreclosure; it just depends when the buyer reaches out to the lender. Buyers beware; it's not uncommon for the closing on short sale properties to take 6 to 12 months, with the bank trying to get back every dime they can, even possibly delaying the sale further by rejecting the offer the seller initially approved. If the property owner is 90 or more days late in payment and has not tried to amend the situation with the lender, the foreclosure process begins by serving the owner legal notice. The property is still owned by the owner, and it may or may not be a short sale. The pre-foreclosure process doesn't guarantee the property will ultimately foreclose. Most banks prefer to work with homeowners vs. becoming the owner of another foreclosed property. For buyers, there is an opportunity to purchase during the pre-foreclosure process, but, at this point, it is widely regarded as the most difficult time to buy. Typical circumstances for attempting to purchase during pre-foreclosure includes buying before the house is listed and writing an offer that states you’ll buy the home outright. After the pre-foreclosure process, the mortgage lender has seized the property. 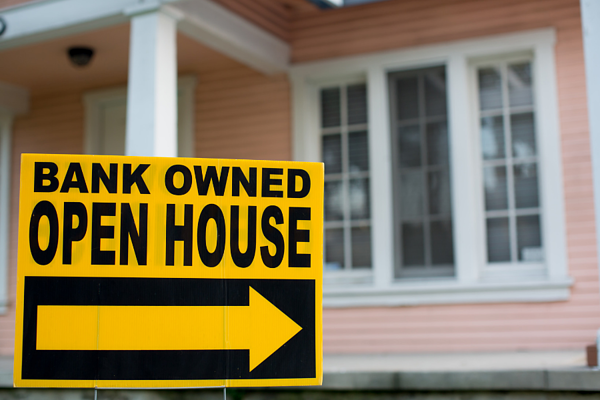 Buyers should note that purchasing a foreclosure is different than a traditional sale. Most houses are bought sight unseen, “as is” during an auction where investors are prepared to buy the property in cash. Also consider that after the transaction, buyers purchase not only the structure, but any liens and mortgages tied to the property. Plus, if there are people still living at the address, the eviction process becomes the buyer’s problem. Bank owned or real estate owned (REO) properties are those that were not sold at a foreclosure auction and given back to the mortgage lender. Because the lender now owns the property, they deal with evictions, liens, and possibly some repairs. These issues, coupled with multiple state foreclosure regulations, require a mountain of patience that very few buyers have. The only hurry in this process is the one military members are familiar with: hurry up and wait. An REO purchase is similar to a traditional home sale in that you’ll benefit from a professional appraisal and detailed home inspection. After the results of the evaluations, many REO properties turn out to be a poor purchase. If purchasing an REO, buyers might run into the possibility that the bank insist that they work with the bank’s broker. They are attempting to save money and time by avoiding paying a buyer’s agent and the bank’s broker commission. Sometimes, first-time buyers assume the bank that owns the property will also lend the money to buy the property as part of one big deal. This is not the case. REO brokers don’t approve home loans. Their concentration is to rid the bank of bad assets. The ability to spend time researching a property is a benefit of buying an REO instead of through an auction. Extensive time is needed to carefully investigate the details of the property. If the home is too far gone into disrepair, it will be difficult for any type of mortgage approval to come through. It's possible to write inspection contingencies within the offer to try and retrieve any deposit money if a home inspection goes badly, but it's not common for banks to consider these types of clauses during a foreclosure purchase. Uncovering how long the property was unoccupied and uncared for helps to establish how much money for repairs is needed. An experienced home inspector who works with foreclosed homes is a strong ally. They’ll point out indicators ranging from major cash investments to normal wear and tear issues. 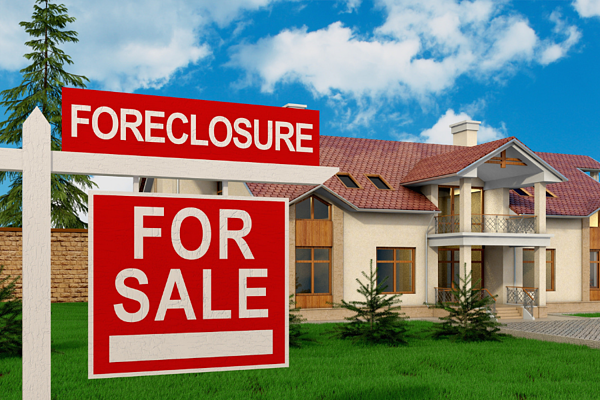 A title search is another must-do for considering buying a foreclosed home. These searches dig up all kinds of stressful problems. When the bank owns the property, they don’t necessarily have to clean up any issues with liens and back property taxes. The IRS considers the owner, potentially you, to be the one on the hook to pay up. Lenders list their REOs on the Multiple Listing Service (MLS). Any real estate agent has access to this inventory. Many bank websites have dedicated REO listings which are available for public viewing. There are other online foreclosure listing services available, but charge users a fee. Can Military Members Use a VA Loan to Purchase a Foreclosed Home? Yes. VA loans can be used to buy a short sale or foreclosed home, but there are many factors to seriously consider before hunting for your property diamond in the rough. The VA does allow the purchase, but the required features of the property remain the same as any house purchased with a VA loan, including an appraisal which will detail the condition of the home and determine the value. Your chosen property must submit to an appraisal to ensure the Minimum Property Requirements (MPRs) are in good standing. If they are not, the financing won’t be approved. 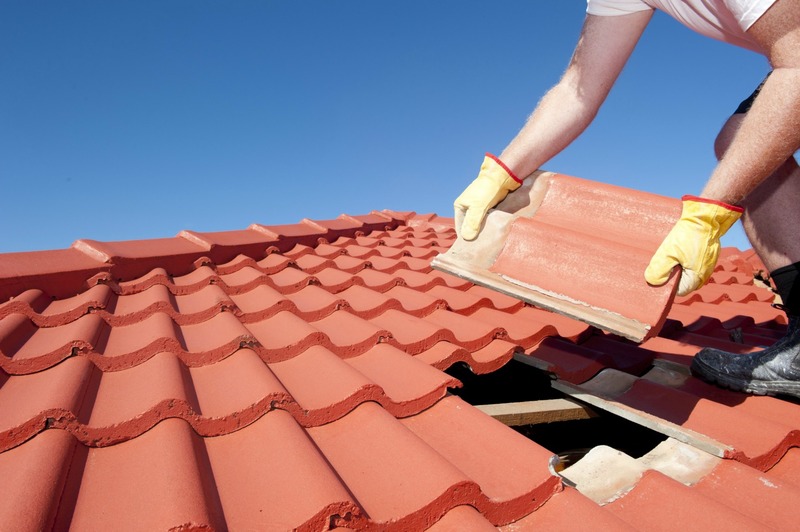 MRPs are investigated in several areas: the condition of the roof (must not have major defects), mechanical systems (heating, electrical, plumbing), windows, and removal of all lead paint. Remember, foreclosed properties likely have damage and disrepair from lack of upkeep. The fixes are yours to pay for if you want to meet the MRPs and have the appraisal go through. For more details, read 3 Tips for Buying a Foreclosure with Your VA Home Loan. Talk with your real estate agent about the option of the seller/bank paying for the updates needed to make the MPRs. Although not common, these seller fixes could simplify the process and move the VA loan approval along faster. A VA guaranteed loan will not be issued for a property that does not appraise for its sale price. Value issues are common if the property is located in area with very few bank owned properties because the comparable properties in the area drive up the foreclosed home’s price, but not the value--according to the VA appraiser. Your real estate agent might advise to make a Reconsideration of Value request if the gap between value and sale price is out of sync with your market. Auctions are typically the first stop for a foreclosure sale, which makes VA financing difficult, because auctions require a large cash payment, are sold “as is,” and sold to the highest bidder. 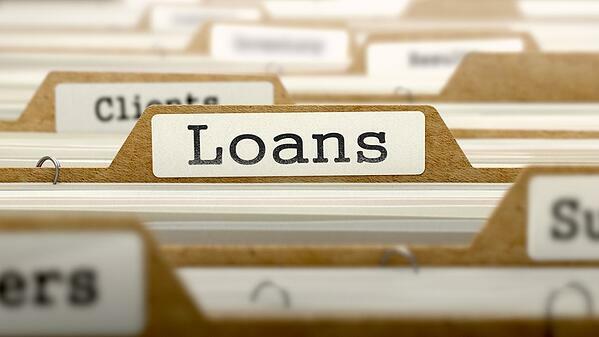 Most service members utilize a VA loan because a down payment is not required. If the home doesn’t sell at auction and changes to an REO, you’ll have a better opportunity to become a homeowner because when the VA is ready to sell foreclosed homes, they list them through a property management service called Vendor Resource Management (VRM). They'll also be listed on the MLS, and your real estate agent can help navigate a process that is more similar to a traditional sale. A foreclosed home purchase is not for everyone. In fact, most military members don’t have the time or cash on hand to make the process worthwhile. Deployments, TDYs, and family obligations put strains on the free time that is needed to babysit the foreclosure process. Keep in mind, purchasing the first foreclosed home that captures your interest doesn’t often happen. Part of this process is choosing home after home because your offers have been refused for a multitude of reasons. It's not uncommon to write several offers before one sticks. If buying a home is a certainty for you, don’t rule out the inventory of homes for sale at MilitaryByOwner. Price points vary, and you never know when a motivated seller is ready to move on. You could be there to take advantage of an attractive price.